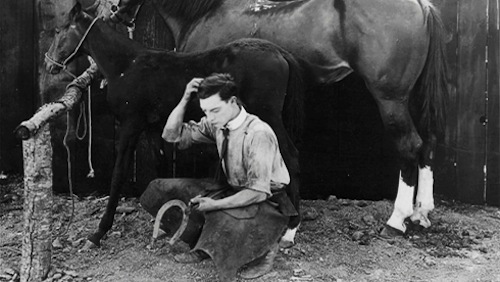 Fran Jurga`s Hoof Blog: News from Hoofcare + Lameness: Father's Day Video Treat: Buster Keaton in "The Blacksmith"
Father's Day Video Treat: Buster Keaton in "The Blacksmith"
It may have been made in 1922, but it will still make you laugh. One of the world's all-time great film stars and comedians didn't need a voice. You don't need to hear his hammer strike or his fire hiss or the horse's hoof hit the smithy floor. He's so good, he makes you hear it. Settle down for 20 minutes and watch a bit of film history. And if you're a father, happy father's day. Old car buffs will like the vintage Rolls Royce in this film! I like the rolling ladder, not to mention all the wooden boxes of horseshoes. I liked the display of sample horseshoes too; it looked like he had a sample of a rope shoe or pad, used to prevent slipping on pavement. Don't you wonder how they set this up for filming and where they found the props? Or did they just remove one wall of an existing shoeing shop somewhere outside Los Angeles? Keaton was the director as well as the star of this film. I wish I knew more about how and why and where he made this little gem of a film. The video is hosted from archive.org, and we appreciate their help in making it possible to share it with you. Update: In 2013, a new cut of this film was unearthed, so there are now two versions of this film, with different scenes. This one is the original, longstanding version but wouldn't you love to watch them both! Thanks to Susanna Forrest, author of If Wishes Were Horses, for assistance with this article. 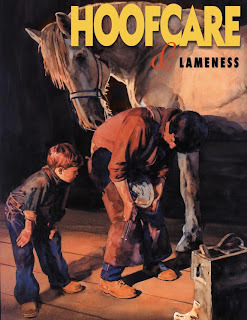 Here's one of my favorite-ever covers of Hoofcare & Lameness Journal, perfect for Fathers Day! If you double-click on the image, you should be able to see it in a larger size.